A couple of months ago, Journalist Nicholas Kristof wrote a controversial op-ed column in The New York Times about how “The Media Helped Make Trump.” In the piece, he argued that the $1.9 billion in free publicity that the media has given Donald Trump so far during this election cycle has provided him with a platform from which to spew “outrageous statements that [draw] ever more cameras — without facing enough skeptical follow-up questions.” In the aftermath of Kristof’s piece, readers and journalists fervently debated the veracity of his claims. Please note: Our election dashboard is automatically updated each week with new traffic data for all candidates. The results surprised us, suggesting that while journalists seem to be preoccupied with covering Trump, the public is not especially interested in reading about him. The average number of page views for an article on Donald Trump is very similar to the average number of page views for an article on Hillary Clinton, Bernie Sanders, or Ted Cruz. 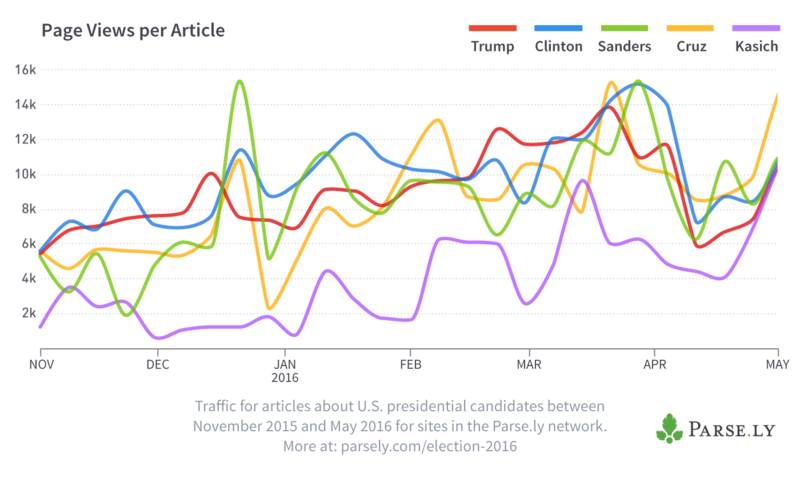 In fact, Clinton — not Trump — receives the most views per article. This data highlights the strong influence of the media: to a large extent, the public reads whatever it is the media decides to write about. The two charts above suggest this is simply not true: on average, an article on Hillary Clinton receives six percent more page views than an article on Trump. Thus, Trump does not appear to be driving revenue. But if the media isn’t covering Trump to boost revenue, then why have so many articles been written about him? The chart above reveals that, in the last six months, there was no single month where articles on Trump consistently outperformed articles on other candidates. Clinton and Trump had similar numbers back in December, and there is no clear trend in this chart that could explain why the media wrote so many articles about Trump. Perhaps the media writes so many articles about Donald Trump because these articles tend to go viral on social networks and bring in a lot of social referral traffic from sites like Facebook and Twitter. After all, Facebook has become the number one source of external referrer traffic, and many publishers are pursuing strategies to become more viral. Search engines, led by Google, are another important source of external referrer traffic, so if Trump articles brought in a lot of readers through Google, it might also make sense for the media to devote more articles to him. However, as you can see in the charts above, publishers who wanted to bring in external referrals through social or search should have written more articles about Bernie Sanders versus any of the other candidates. 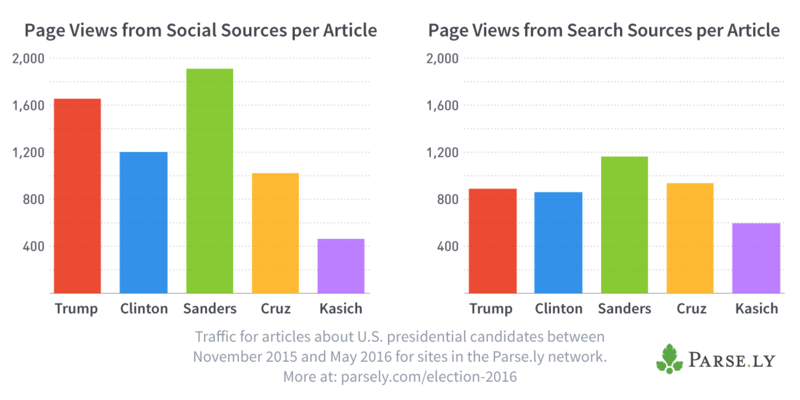 Parse.ly data clearly shows that online media is not providing equal coverage to candidates, as one might expect if it were trying to live up to the ideals of our democratic society. This may come as no surprise. However, our analysis also shows that online media did not maximize revenue or social virality by focusing its attention on Trump, despite widely held perceptions to the contrary. 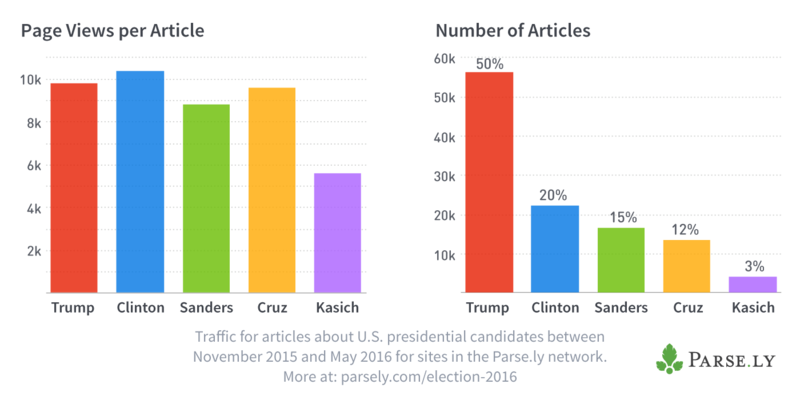 So why did online media write as many articles on Trump as on the other four major candidates combined? The fact is that in the midst of today’s 24-7 news cycle, most journalists can devote only a small amount of time to their next article, and so they often find themselves choosing topics that are convenient to write about. Imagine you’re a journalist in front of a blank screen, thinking about your next story, and faced with intense pressure to pump out content. There may be no clear breaking news on Clinton, Sanders, Cruz, or Kasich — so writing about these candidates may require you to conduct research or reach out to voters. On the other hand, your Twitter feed is full of the “events” that Trump so routinely creates and which feed personality-driven celebrity journalism: politically incorrect comments, bogus claims, and far-fetched promises. Whom would you write about? By choosing which stories to present to the public, journalists have the power to set the political agenda. The charts at the top of this post show that readers paid similar attention to articles written on any candidate (with the exception of long-shot candidate Kasich), indicating that by and large, readers will follow journalists wherever they lead them. Trump’s scandalous behavior produces soundbite after soundbite, and journalists — racing to post the latest story — are letting their readers down by allowing non-events to dictate their coverage. The media’s focus on Trump has not benefit either readers or publishers. There is a widely held view that Donald Trump is a necessary evil for the media in this election cycle — a topic that will generate page views and revenue for publishers. This analysis demonstrates that Trump coverage may not be so necessary, and that editors and journalists should let data, rather than “gut feelings,” guide their decisions about future coverage. Yet, if this analysis proves anything, it is that newsrooms are not beholden to the data that they uncover. Many of the media companies we work with at Parse.ly encourage a data-driven culture that makes it easy for their employees to make informed content decisions. For example, anyone using Parse.ly can perform an analysis similar to the one we shared above. Simply select all articles associated with each candidate by tagging each post with the candidates that it covers. Then, look at key metrics associated with each candidate, such as the number of page views and page views per post. It’s also possible to break these metrics down by different referral sources. Are you listening to the type of content that resonates with your readers, or has your newsroom covered topics (like Donald Trump!) that are not as appealing to them? No matter what you ultimately publish, it is important to take the data into consideration. Are you interested in learning more about the media’s role in the U.S. Presidential election? Stay tuned for more insights on Parse.ly’s blog.